Aaron's, Progressive Leasing, Warrick Dunn And Partners Surprise Augusta Family With Fully Furnished Home | Aaron's, Inc.
ATLANTA, March 26, 2019 /PRNewswire/ -- Aaron's, Inc. (NYSE: AAN), a leading omnichannel provider of lease-purchase solutions, and its divisions Aaron's and Progressive Leasing, provided the furnishings for a surprise home presentation last Tuesday to an Augusta single mother and her four sons as part of the Homes for the Holidays (HFTH) program sponsored by former NFL star Warrick Dunn. 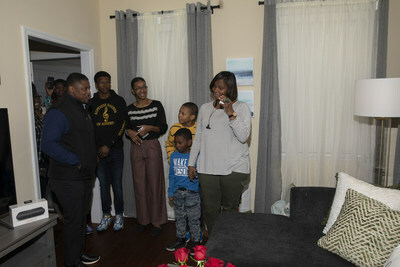 The presentation of the home to Valencia and her family was the 169th by Warrick Dunn Charities' (WDC) HFTH program, which assists single parents in becoming first-time homeowners. In partnership with Aaron's, WDC provides the materials necessary for long-term stability and the provisions required to make a meaningful impact on the parents and their families. The home comes as part of the City of Augusta's Homeownership Assistance Program, which assists first-time home buyers in purchasing homes within Augusta-Richmond County. Peach State Federal Credit Union (FCU) has committed $20,000 to Warrick Dunn Charities, $10,000 of which has been invested in this project. The remaining donation will go towards a future Home for the Holidays recipient. In addition to the generosity of Aaron's and Peach State FCU, this home is also sponsored by the Mortgage Bankers Association of Georgia. 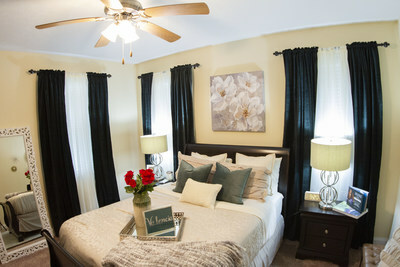 "Aaron's is grateful for the opportunity to work alongside Warrick Dunn Charities to provide a deserving Augusta family a safe place to call home," said John Robinson, CEO of Aaron's, Inc. "We have a longstanding tradition of giving back to communities across the country and we're so pleased that these furnishings will be able to help make a difference for this family in their lives for years to come." "At Warrick Dunn Charities, we're committed to helping deserving parents secure homeownership and understand the system around that process so they will be successful for the rest of their lives," said Warrick Dunn. "Thanks to our partners such as Aaron's, these families do not need to worry about furnishing their homes and can focus on improving their lives and communities." Warrick Dunn Charities provides hope and healing to communities through innovative programming inspired by our Founder's life journey. Since 1997, the Homes for the Holidays program has rewarded 169 single parents and 420 children and dependents that have achieved first-time homeownership in Atlanta, GA, Baltimore, MD, Baton Rouge, LA, Dallas, TX, Jacksonville, FL, Tallahassee and Tampa, FL. Serving single-parent families nationwide, WDC and its partners have combatted poverty, hunger and ensure families have basic necessities and comfortable surroundings to improve their quality of life. Betty's Hope, a mobile children's bereavement program provides students aged 5-18 with a safe and responsive environment for them to heal and enhance their quality of life after experiencing a loss. For more information, visit www.wdc.org. Peach State is a $491 million credit union that serves more than 60,000 members in Georgia and South Carolina. As a financial cooperative, Peach State's mission is to meet the needs and exceed the expectations of its member-owners. To learn more, visit www.peachstatefcu.org or www.peachstatefcustories.coop. The Mortgage Bankers Association of Georgia is a leader in Georgia's real estate finance industry. Our Mission is to promote the highest professional and ethical standards, provide education and industry-wide networking opportunities and act as one of the industry's leading voices on legislative and regulatory issues.